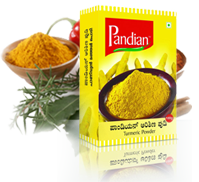 Live the flavor of traditional Indian food with Pandian Foods, where you will experience the use of quality ingredients with mouth watering aroma. 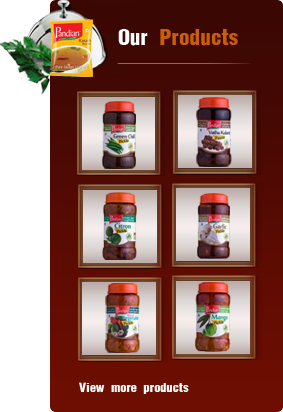 We provide you the best quality Indian Pickles & Indian Spices for you to enjoy the delicious South Indian foods. South India’s food culture is well known all over the World. Recipes here are prepared using varieties of spices and other ingredients. Preparation of South India’s food involves a long process which is time consuming. Though the taste of the food will make you fall in love with it yet spending hours of time at the kitchen has become a task in today’s busy life. But people long for a delicious Indian food. And for those who seek for a scrumptious food, on a daily basis along with the busy work timing, we, Pandian Foods, are here to serve your needs with blended Indian Spices & Inidan Pickles. 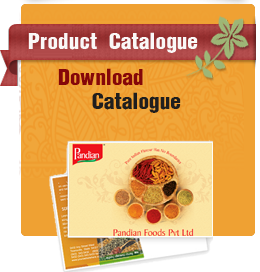 Copy Rights Pandian Foods (P) Ltd 2012. Designed By Webindia.